Okay, this was posted earlier, but due to Blogger working in mysterious ways, I lost the post. So, below is an edited version of the post from early this morning. Before anyone runs off thinking Mrs. League is evil and vindictive, I just want to congratulate you on your astounding insight. No, no, no... I kid because I love. Mrs. League has always had it in for Garfield. League archives reveal a troubling visit to the the McBride household years ago when The League and the Impending-Mrs. League were but starry-eyed kids. I don't know what started it, but I was sitting at the kitchen counter drinking coffee and reading the Lawton Constitution, and the McBrides went, jointly, into a tirade regarding both The Family Circus and Garfield. The League sat in stunned silence. You see, The League always secretly loved Garfield (but decided The Family Circus has outlived it's usefulness in 1977). The League used to have Garfield books strewn about his bedroom, an Odie doll perched atop his "Return of the Jedi" bedspread, and owns, to this day, the vinyl to the Soundtrack to Here Comes Garfield (the title song of which is sung by the amazing Lou Rawls). It didn't seem like a big deal at the time. 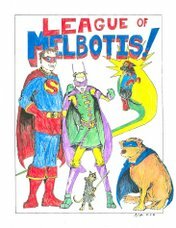 The League kept his mouth shut, and let the McBrides air their Garfield related grievances. He thought, at the time, that this really wasn't worth breaking up over. At least, not until he got home again. And through 5 years of marriage, The League has kept his head down, only occasionally fessing up to thinking Garfield strips were really, really funny back in about 1978-1983. But Mrs. League... Mrs. League has it in for Garfield. We don't know if its the lasagna bit (which still kills, by the way), or the fact Garfield hates Mondays, or that he won't eat raisin toast or Garfield's hilarious fear of spiders. We don't know. The movie was oddly NOT a polarizing moment. Mrs. League hates Garfield anyway, so hating the movie was a logical extension. The League was upset to see the strip sucked dry, its simplicity tattered, and Odie not looking remotely like Odie. And the League kind of wishes plagues of locusts upon both Breckin Meyer and Jennifer Love Hewitt (even as he wishes to ogle Ms. Love Hewitt). So, RHPT and Jim D, please do not take Mrs. League's moment of rage personally. Its just that you have brought an unspeakable evil into her house. An evil which The League's morbid curiosity will surely force her to endure. While The League is aware RHPT and Jim D did this primarily to taunt The League, Mrs. League knows the League's capacity for enjoying awfulness all to well (see the multiple viewings of From Justin to Kelly). And she knows that the DVD player is housed in a central location at League HQ, and she will not be able to escape. No matter how hard she tries. So, once again, thanks to RHPT and Jim D (or, as I am learning, mainly Jim D) for their generous and unexpected gift. The League will at least enjoy ogling Ms. Love Hewitt, even as she delivers a less than stellar performance in what is sure to be a crap-fest of a movie. In the meantime, we will watch the film and try not to think too hard upon what might have been.